I'm enjoying the third day of Berlinale film festival. I got some spare time and went to Kurfurstendamm with my mum. I bought this blue hat in Urban Outfitters, and later the same day, in American Apparel, another, very similar hat, but different shade of blue. Looks like blue is my color of the day. I went to KaDeWe and I bought a few things there too. Stuff that's been on my wish list for a long time. Besides that I really had so much fun with my family. This trip makes me spend more time with them and that's what I've been missing back home in Zagreb. I decided to spend more time at home with them because for me that's one of the most positive things in life. As for the photos, I'm sorry for the bad quality. I have to mention that one person yesterday made a comment on my post saying - ''what do you know about freedom, you're materialistic''. I never judge a person before I know him or her. I really don't see why do people have that need to write mean things and share negative energy around the internet. Tell me that my shoes are ugly, tell me they don't fit with my sweater, that's all fine, it's your opinion on the outfit. But please don't comment something you don't know anything about just to make that person feel bad. That doesn't go only for me, I mean it in general. I guess when you write something ''badass'' like that it makes you feel like you're better then me. If that's how you want to feel then your goals in life are very sad. This is my ''personal diary'', and if you don't like it then don't read it! This is about fashion that has become a fun part of my life, but not it's meaning. You obviously can't get to know me trough this blog, only my fashion style. I don't need you to share negative energy around here, because I'm a positive person and I'll continue being that with or without you. I love life, my family, and every person on this planet, even you. I love freedom in general. So since you obviously know more about freedom then me, why do you wish to put limits on it? Open your eyes, and most importantly share the love. 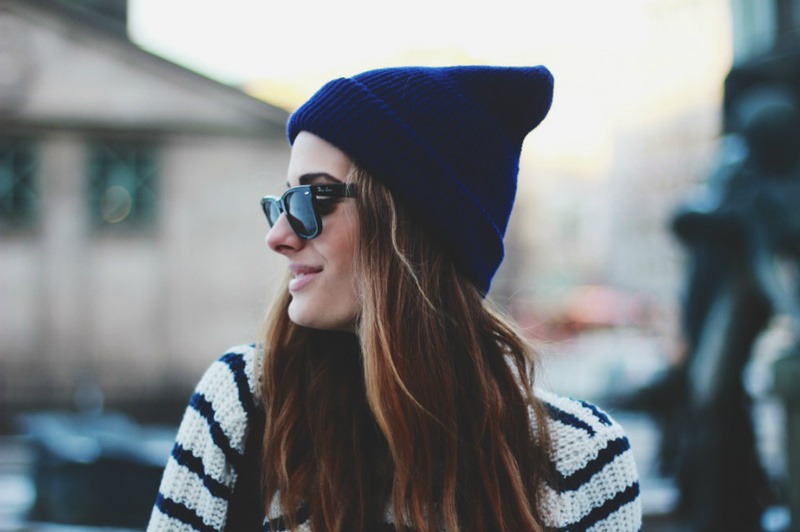 lovely post and outfit, your hat looks perfect with the jumper! I love the text. More people should open their minds! Zaborave da je poenta UMETNOST, MODA, STIL! This is a great look! I absolutely love that sweater. Beautiful dear. The sweater looks fantastic on you. izgledas bas cool, a zavidni ljudi ce nazalost uvjek biti. Super ti je kombinacija,volim tvoja casual izdanja.A što se tiče takvih komentara,znaš da dolaze od nekog tko je ograničen pa modu i stil automatski povezuje s materjalizmom.Ja te ne poznajem ali smatram da nisi takva,materjalisti se obično nakite najskupljim kičem bez smisla i stila,a na svim tvojim kombinacijama se vidi tvoje raspoloženje,stav,igranje s modom-a to je nešto što se ne može kupiti.Nažalost nisu se svi rodili sa smislom za stil i ukus pa onda imaju potrebu vrijeđat po ovakvim stranicama. omg! i really adore this watch of yours but don't you think that each and every blogger girl has it and it became lil' bit boring? I don't think you can judge me for wearing something that reminds me of a dear person that died last year... You're very mean.